It was the show we were all waiting for for a few seasons. A real Viktor & Rolf show, which gives you goose pimples, makes you cry a little and wonder for a few moments what the designers’ message was. Supermodel of the eighties Kristen McMenamy took the centerstage as a stationary mannequin dressed in 12 layers of coats, jackets and one or two dresses. The two designers undressed her on a rotating part of the runway by taking off one layer at the time and put that layer on a model who showed it walking along the catwalk. 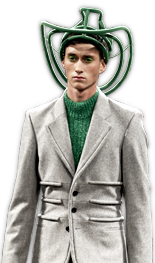 The second half of the show the designers put another 12 layers back on McMenamy. The collection was mostly black with silver and white as contrasting elements. The focus was at big coats, sporty outerwear like anoraks, nylon/silk dresses, transparent shirts and short dresses. The most interesting part of this performance was the way it affected the audience. I was feeling stressed and wanted the designers to hurry and get ready before the other model arrived with another layer to put on. 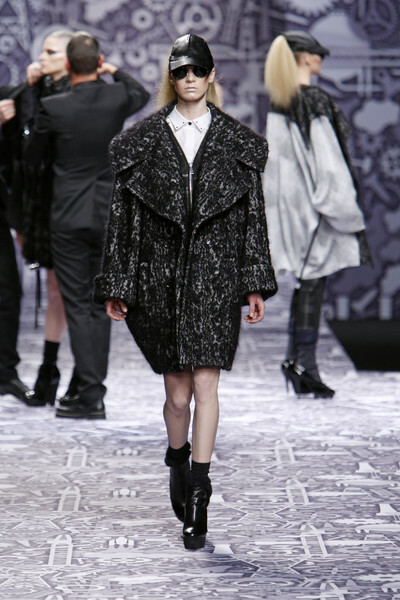 But Viktor Horsting and Rolf Snoeren worked in their own pace and it looked like a well-oiled machine. I waited 3/4 of an hour backstage to get a comment of the designers on their collection, but too many people wanted to shake their hands and too many celebs needed a picture. So I’ll try to make a little translation myself: was this collection about the whole fashion-system as a machinery, all the little parts that make the whole machine going? The walls and catwalk were covered with paper designed by Studio Job with graphics referring to tools, machines, factories etcetera. Or was this also about the clothes were zippers and straps transformed the silhouettes or which were totally convertible themselves ? A press release e-mailed after the show explained that the concept was an expansion of the couture show the duo staged ten years ago with Maggie Rizer as the Russian doll. 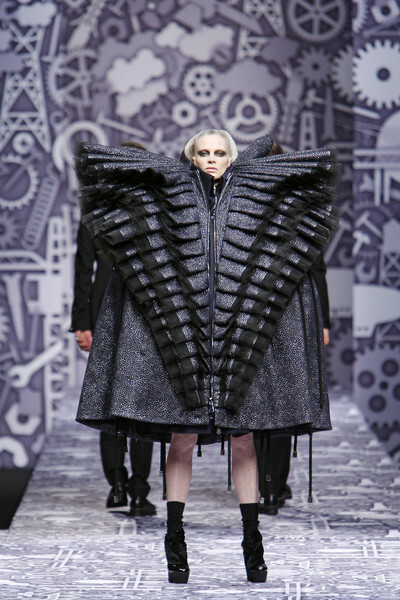 “This time around, we wanted to show the possibility to be BOTH wearable AND extreme at the same time!” Ah. At the end of the show the audience felt almost relieved that the designers made it till the end and the final outfit blew everybody’s mind. The cheering and applause was well deserved.